It’s Wednesday, so time for my next blog interview … and this time it is with Rachel from Little Koo, a blog that I discovered almost two years ago. I was immediately drawn to Rachel’s blog because it combines tips about Hong Kong, excursions to tucked away beaches and hikes, as well as a few DIY activities – and of course, her jewellery showcase, which she sells at her Etsy shop. 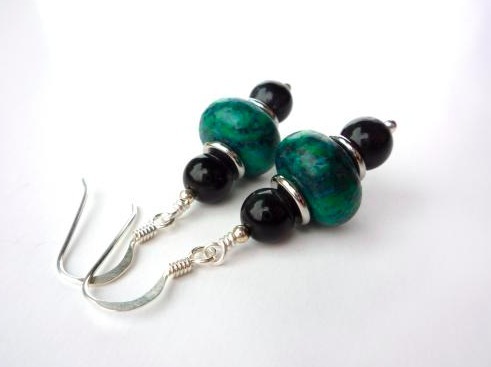 I have met Rachel at one of the Handmade Hong Kong fairs in Discovery Bay and bought some lovely earrings of her – I always get comments when I wear them! 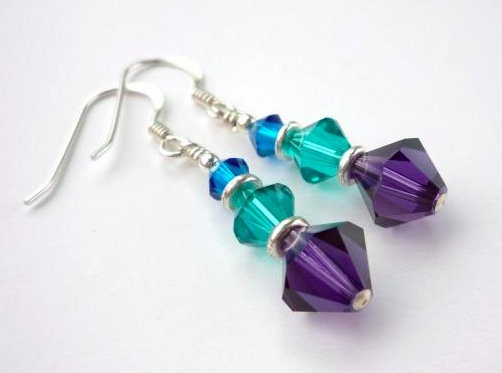 And I have followed her blog over the last 24 months, which turned from a purely ‘Hi – I’m new to HK and I’m selling jewellery’ blog into a ‘Hi – I enjoy HK, here are some recent jewellery designs I’ve made, showcases of other great Etsy finds – and meet my twins Jack and Isobel’. Both babies are so adorable, I’m always looking forward to one of the updates where Rachel shares her experience of looking after those two cuties, travelling with them or just some things she created for them. I started my blog Little Koo not long after moving to Hong Kong with my husband. I wanted to share the things I was seeing and doing in Hong Kong with friends and family back in the UK. It is also a way of spreading the word about my jewellery making and my Etsy shop, also called Little Koo. Since dipping into the world of blogs, I have since become a little addicted to reading other people’s blogs too, and the many craft blogs I read inspire me to have a go at some crafts myself, which I also share on my blog. Your blog is focused on making jewellery – where do you get your supplies from? How do you come up with your unique designs? Where do you sell them? I get my supplies from a number of places, I’m always trying to find new, good suppliers! There are some great places to go in Hong Kong if you want to make jewellery for fun, especially Yu Chau Street in Sham Shui Po. I get some of my supplies from there, particularly the semi-precious gemstones I use. Most of my other supplies I buy online. My current favourite supplier is http://www.internationalcraft.com – they have a great range of the kinds of supplies that I need. I also find that Etsy is really good for sourcing some hard to find items! I come up with my designs in a number of ways. One of my favourites is when I buy some beautiful beads and play around with designs until I find a way to use them. Other designs are inspired by a new technique I’ve learned, or a pattern or style I’ve seen elsewhere. I’m very careful not to copy other people’s designs, but I find that whenever I make something that has been inspired by someone else it always ends up quite different anyway! As I already mentioned, I have an Etsy shop where I sell my jewellery. I also sell at the Handmade Hong Kong craft fairs throughout the year. Unfortunately, I won’t be at the next couple of fairs (the next one is on Sunday), but if you go to the Discovery Bay fair on 9th November, you’ll see me there! After a few years in HK (and now with your adorable twins), what do you love/hate about the city? There are many things to love about Hong Kong. For a westerner, it’s a very easy city to live in. There is a lot of English spoken here, and you can buy lots of Western food in the supermarkets (albeit expensively sometimes) and restaurants. But it is still very Chinese and it’s a great way of seeing another culture. And the food is amazing! I think one of the best things about Hong Kong though, is that there’s so much more to it than just skyscrapers. In half an hour you can be on a beach, hiking in hills or on a ferry heading out to an island. We haven’t been able to get out of the city much lately because it’s been so hot and it’s harder to get out with the twins, but they are getting bigger now and we’re looking forward to doing lots in the winter! Having just been through another summer in Hong Kong, I would say that the heat is the worst thing about living here. You just can’t do that much for 4 months of the year (but the winter is mild and dry and is lovely!). The apartments are very small because space is at a premium, and that is another thing that is harder when you have small children. It’s also quite impractical to have a car here so getting out and about with the twins on public transport is quite hard for me! What tips would you give visitors with toddlers that come to HK for the first time? Are there any kids-friendly restaurants, hidden parks and playgrounds that are great for a rest and what about exploring museums/outlaying islands? Hmmm, I’m not sure I can be that helpful with this one as my twins are a bit too small still to get out and about too much. Unfortunately, Hong Kong is not very baby friendly! Depending on where you go, it can be difficult to get around with a stroller (I’m thinking of areas like Soho here), so if you have a baby carrier that can be really useful. Lots of people use them here. I think it would depend on what time of year you came too. If you come in summer (May-September) then you will need to think carefully about what you do because your children will get really hot! Short outdoor trips followed by a meal or other indoor activity is a good way to do it. There are also loads of cheap outdoor swimming pools, which is a great activity to do in summer. In winter, many of the shopping malls have ice rinks, which would be a fun activity for kids. As for things to do with children, I think it depends on what your child likes. I really like the Hong Kong Museum of History, as it has giant re-creations of different eras in Hong Kong’s history, rather than things displayed in cabinets. I’ve not been to the Science Museum, but I’ve heard it has a whole floor which is designed for toddlers. Hong Kong Park has a great aviary and a playground, and close by are the zoological and botanical gardens which have monkeys and other birds and animals. If they like transport, then why not see the city on a tram ride? Or take a ferry to one of the islands, and maybe hit the beach when you get there. What three blogs do you recommend – this could be anything from jewellery making and DIY projects to raising kids in HK?! Ooh, this is a hard one, I have so many favourites! I have to admit that bluebalu is my favourite Hong Kong blog, Ruth just posts so many interesting insights into Hong Kong! I also like The Fragrant Harbour, which keeps me up to date with the latest Hong Kong issues and wranglings with the mainland. Jewellery-wise, The Beading Gem’s Journal is a great resource. Pearl serves up a daily dose of jewellery inspiration, tutorials, techniques and tips. Heaven for any jewellery maker! I follow a LOT of DIY blogs, so it’s hard to choose a favourite! I think I’m going to go for Minted Strawberry, which is one of my newer finds. Aki posts a lot of jewellery DIYs but a range of other projects too. So much inspiration! Thanks for the interview Rachel, it was nice talking with you. If you fell in love with Rachel’s jewellery and design and would like to discover more about her products and stories of Hong Kong, head over to her Little Koo blog or check out her Etsy shop.